Today in Burkina Faso women and girls are not always free to choose when they marry, and who; when they have children and how many – this has to change. After this excursion through different models of gendered mobility between ENP countries and the EU, we now come back to our initial question. 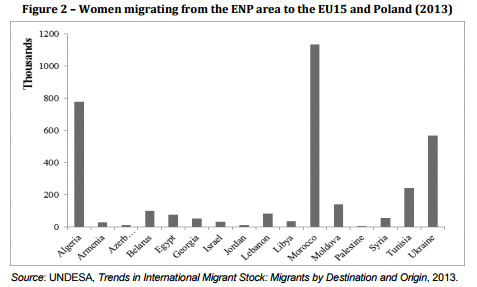 What are the limits of ENP policies regarding female migration across the eastern and southern Mediterranean? To date the ENP framework does not seem to have taken significant steps to promote a safe and autonomous migration specifically for women from the ENP to the EU. The cases of Moroccan fruit pickers in Spain and Ukrainian domestic workers in Poland show how women’s labour opportunities are predominantly characterised by temporariness, difficult working conditions and poor legal protection. There is a transnational hierarchy that confines women to care and domestic work, or to the seasonal agricultural sectors, which are all variably located across a continuum of illegality, exploitation and invisibility. In both the countries of origin and destination women suffer from economic and structural disadvantages. Migrant women come into sight as transnational figures more suitable to find work in flexible (agriculture) or gender-biased (domestic and care) labour markets. At the same time, they are far from being prospective full citizens in the countries of destination; on the contrary, they are destined to short periods of stay, invisibility and to being on the margins of social and civil entitlements. The type of circular migration they are embedded in, moreover, allows for the welfare costs to be totally upheld by the country of origin. 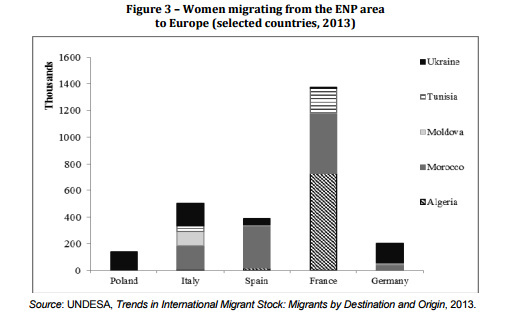 From the perspective of ENP frameworks and categorisations, migrant women do not seem to fall into the category of the economically rewarding working migrant “who sends remittances,” nor into that of the entrepreneur who facilitates trade across the borders, nor finally into that of the cultural mediators that spurs innovation amongst his/her diaspora fellow members. The case of Moldovans in Italy might be seen as the exception to this overall view, but the specific connotation of the employment available to these working women in the Italian home care sector (thus very isolated, badly remunerated and socially stigmatised) prevents them from becoming transformative social actors, either in the country of origin or of destination. It is also a sector where migrant women cannot generally fulfil their aspirations by capitalising on their education and the work experience they have accumulated in the country of origin, resulting in their gradual deskilling. Domestic work, in general, comes into sight as a significantly double-edged job opportunity for migrants, as far as it offers employment on the fringes of an EU labour market, in a sector characterised by lack of rights and by a scarce economic and social mobility. 5. Finally, promote the active role of women as transnational actors between ENP countries and the European Union, by designing specific policy tools for gender mainstreaming in this field. Such provisions would help the EU to meet its proclaimed interest in enhancing gender equality in neighbouring countries. At present, the EU is not always critical of the gender biases of migrants’ countries of origin, but, rather, reproduces strong gender stratifications and inequalities in its ENP approach to migration. To embrace the recommendations above would help to overcome the current gender blindness in ENP migration policies which seem to position migrant women along a geographical and gendered hierarchy of care and domestic work, or low paid and gendered and racially constructed seasonal agricultural work, which reifies their roles as “carers with extra work burdens” rather than as workers. This could be a first step to dismantle the gendered (and racialised) material and discursive devices that structure women’s mobility across the eastern and southern Mediterranean. It goes without saying that the expansion of the private market for home care service has had a deep impact on labour opportunities for Moldovan women in Italy and so on the level of immigration.37 Italy is one of the European countries where the private market of home-based elderly care provided by migrant women has been established for the longest time – since the end of the 1970s – and where it has grown extensively: today, 88.6 percent of the Italian private service sector is made up of women and 81 percent by migrants.38 It is relatively easy for foreigners to access this job sector, in comparison with what happens in other countries. Regularisations are the main gate of access in the context of Italian migration policy, and indeed domestic and care workers have received special treatment in the regularisation of 2002, with the extension of the applications deadline. In 2009 the government took further special measures to favour these workers with an ad hoc regularisation. This has resulted in a general increase in the official numbers of foreigner workers in this sector. Finally, it is important to consider that, in the yearly allocation of quotas for migrants, the government always assigns a relatively high number of permits to prospective care and domestic workers from specific countries of origin, included Moldova. More generally, the arrival of Moldovan women in Italy has been clearly facilitated by specific government provisions. Indeed, official data on Moldovans’ presence in Italy have boomed after the government’s launch of a regularisation process for undocumented migrant workers in 2002: with 29,471 applications, their (official) presence in Italy has multiplied five times.39 Again in 2009, at the time of a regularisation directed only to undocumented workers in the care and domestic sector, Moldovans have been incredibly active by submitting 26,605 applications.40 Furthermore, Moldova and Italy have established a bilateral agreement for workers’ recruitment, which was signed in 2003 and renewed in 2011.41 There is therefore an ad hoc quota for Moldovans in the yearly state decree which regulates the quotas for new foreign workers in Italy. Between 2002 and 2010, more than 27,000 Moldovans entered Italy through these quotas, without counting those that, as domestic workers, could also apply for the 290,000 vacancies in the quotas for this sector.42 More recently, in 2008, Moldova signed a visa facilitation agreement with the whole European Union which was followed by a visa exemption for Moldovans entering the Schengen area for short stays, starting from 28 April 2014. It is thus an open question as to how this last facilitation will affect the movement of Moldovan women to the EU and Italy in particular. The case of women’s migration from Moldova and Italy thus stands in opposition to the three cases that we have previously illustrated. Without forgetting the ample margins of undocumented migration that still persist between Moldova and Italy, as well as the difficult conditions in which regular migrants perform their jobs in the home care and domestic sectors, it is nevertheless important to reflect upon the way this case can serve as an example for other countries There is no doubt that the legal and permanent employment in the domestic sector offers women the opportunity for an autonomous type of mobility, in which they can potentially engage in an activity independently from their husbands or fathers’ will. It allows them to earn a living and take on the role of breadwinner for their transnational households, which they are often able to reunify in Italy. The less precarious legal conditions allow for better conditions of employment, and, under these conditions, domestic work may provide a working and living space that can be relatively safer for women than the conditions they face in factories or agriculture. However, the field of domestic work in Italy is still often low paid, with precarious working conditions, a lack of rights and, in some cases, subject to sexual and physical abuse. Moreover, workers complain that such work does not allow them to climb the social ladder towards more rewarding occupations, more in line with their educational backgrounds. 32 Marta Kindler and Monika Szulecka, “The Economic Integration of Ukrainian and Vietnamese Migrant Women in the Polish Labour Market”, in Journal of Ethnic and Migration Studies, Vol. 39, No. 4 (2013), p. 649-671. 33 Ewa Palenga-Möllenbeck, “Care Chains in Eastern and Central Europe: Male and Female Domestic Work at the Intersections of Gender, Class, and Ethnicity”, in Journal of Immigrant & Refugee Studies, Vol. 11, No. 4 (2013), p. 364-383. 34 World Bank, Migration and Remittances Factbook 2011, 2nd ed., Washington, World Bank, 2011, http://go.worldbank.org/QGUCPJTOR0; Ummuhan Bardak (ed. ), Labour Markets and Employability. Trends and Challenges in Armenia, Azerbaijan, Belarus, Georgia, Republic of Moldova and Ukraine, Luxembourg, Publications Office of the European Union, 2011, http://dx.doi.org/10.2816/14590. 35 Pia Pinger, “Come Back or Stay? Spend Here or There? Return and Remittances: The Case of Moldova”, in International Migration, Vol. 48, No. 5 (October 2010), p. 142- 173, http://dx.doi.org/10.1111/j.1468-2435.2009.00562.x. 36 See Dennis Görlich and Christoph Trebesch, “Mass Migration and Seasonality: Evidence on Moldova’s Labour Exodus”, in Kiel Advanced Studies Working Papers, No. 435 (May 2006), http://hdl.handle.net/10419/4012. 38 Italian Ministry of Labour, Secondo rapporto annuale sul mercato del lavoro degli immigrati, July 2012, http://www.governo.it/backoffice/allegati/68685-7839.pdf. 39 ISTAT, Permessi di regolarizzazione concessi in base alle leggi n. 189/2002 e n. 222/2002 per area geografica e principali paesi di cittadinanza, per sesso al 1° gennaio 2004, 2004, http://demo.istat.it/altridati/permessi/2004/tav4.13.pdf. 40 Italian Ministry of Interiors, Colf e badanti, i dati riepilogativi al 5 luglio, 12 July 2010, http://www1.interno.gov.it/mininterno/export/sites/default/it/sezioni/sala_sta mpa/notizie/immigrazione/0076_2010_07_12_colf_badanti.html_1728265669.html. 41 Marta Giuliani, Franco Pittau and Antonio Ricci (eds. 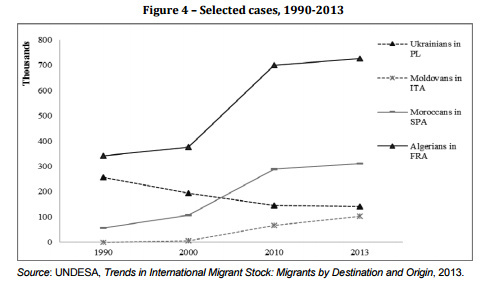 ), Visa Policy as Migration Channel in Italy, Rome, EMN Italy and IDOS, 2012, http://www.emnitaly.cnr.it/eng/wpcontent/uploads/2015/02/Visa-Policy-as-Migration-Channel-2012-.pdf. 42 Sabrina Marchetti, Daniela Piazzalunga and Alessandra Venturini, “Costs and Benefits of Labour Mobility between the EU and the Eastern Partnership Countries Country Study: Italy”, in IZA Discussion Papers, No. 7635 (September 2013), p. 67, http://www.iza.org/en/webcontent/publications/papers/viewAbstract?dp_id=7635. While Algerian and Moroccan migrant women live mostly in a few EU countries – France, Spain and, in the case of Moroccans, also Italy – Ukrainian women are present in a wider spectrum of destinations in the European Union (see Figure 3). Their numbers are particularly high in Italy (168,000 in 2013) as well as in Germany and Poland (about 140,000 in each country). However, we decided to take the case of Ukrainians in Poland as to allow for comparisons with the other three cases under study. The long tradition of migration of Ukrainian women to Poland must be understood against the background of the economic decline of the country, since the 1990s. In this context, women have taken the role of breadwinners required to support often unemployed husbands and school-age children.25 The mobility between Ukraine and Poland has very often taken the shape of temporary migration, facilitated by historical ties, geographical proximity and favourable policies for border crossing.26 From the policy point of view, the present situation is the last stage in a complex evolution of different arrangements. Flows between 1945 and 1989 were entirely regulated by state apparatuses, were mutual agreements and the result of diverse mobility programmes within the COMECON framework (e.g. tourism, student exchanges, cross-border employment, military dislocations, etc.) During the 1990s, and especially after the non-visa agreement of 1996, increasing mobility between Ukraine and Poland developed.27 This is also the time of the so-called suitcase traders who were very active across the Ukraine-Poland border from the mid-1950s.28 This regular movement between the two countries was virtually halted in 2003, when Polish migration policy had to adjust to the standards of the European Union, which required the introduction of visa requirements for non-EU nationals. At present, the legal framework for the entrance of Ukrainians is relatively liberalised: in 2006 Poland decided to gradually liberalise the legislation on employment of third country nationals. This was achieved, on the one hand, by facilitating the issuing of work permits, and, on the other hand, by expanding the catalogue of nationalities who, under certain conditions, are allowed to take employment in Poland without necessarily holding a permit, as in the case of EU eastern neighbours including Russia. In 2008, the Agreement on the Local Border Traffic with Ukraine was concluded, which facilitated the mobility of people living on the Ukrainian border, including the many women who were seeking employment in the expanding domestic and care sector of Polish cities. The reduction in the number of those counted as Ukrainians (although born in what was formerly Poland), together with the fact that the entrance of these Ukrainian workers was not registered after 2008, might explain why the official number of Ukrainian women migrants is decreasing (see Figure 4). Yet it is a matter of fact that their presence in the domestic and care sectors, as well as in Polish society more generally, has increased. In relation to the temporary migration, which characterised the mobility pattern of this group, scholars have argued that migrants from Ukraine have little interest in, or the possibility of, settling in Poland because of economic, legal and cultural constraints. Their aim is, rather, to improve their living conditions at home. For this reason, Ukrainian migrants perceive their migration as a temporary activity, additional to their work at home. This has resulted in a lasting phenomenon of temporary trips and repeated mobility. Some of the Ukrainian domestic workers circulating to and from Poland make use of tourist visas in order to enter the country and work irregularly.29 They are generally live out and do cleaning jobs. Polish scholars point to the risks related to the undeclared character of this work, the structural conditions of the sector and the limited opportunities for mobility within it.30 Ukrainian circular migration has been defined as “incomplete migration,” characterised by short-termism and the unstructured departure of individuals in search of immediate profit rather than being a structured project.31 Along the same lines, Marta Kindler and Monika Szulecka have emphasised the importance assigned by Ukrainians to the ties with their country of origin as a result of the obstacles that they face in the host country.32 Thus we believe that the case of Ukrainian women in Poland is an example of the negotiations taking place around women’s work on the borders of the EU, with the formation of a gendered and ethnicised labour force to be employed in the lowest strata of the European labour market. While Polish women still engage in temporary and permanent migration to Germany, the United Kingdom and other western European countries where they mainly take up domestic and care work in private households, Ukrainian women are doing the same in Poland.33 The overlapping of these different circuits of women’s mobilities denotes the increasing stratification of labour markets opportunities for migrant women. If gendered occupations such as domestic work still play a major role, this is however split into jobs with different entitlements from the point of view of rights and labour conditions. Women on the borders of the EU, as in the case of the Ukrainians, are included in a hierarchical way in this market compared with women holding citizenship from a member country, by being allowed to enter into it only in the most precarious and invisible way, namely as flexible, undocumented privately hired service workers. 25 Suzanne LaFont, “One step forward, two steps back: women in the postcommunist states”, in Communist and Post-Communist Studies, Vol. 34, No. 2 (June 2001), p. 203-220; Jacqui True, Gender, Globalization, and Postsocialism. The Czech Republic after Communism, New York, Columbia University Press, 2003. 26 Aleksandra Grzymała-Kazłowska and Marek Okólski, “Influx and Integration of Migrants in Poland in the Early XXI Century”, in CMR Working Papers, No. 50 (November 2003), http://www.migracje.uw.edu.pl/publ/233; Agata Górny et al., Immigration to Poland. Policy, Employment, Integration, Warsaw, Scholar, 2010. 27 Krystyna Iglicka and Agnieszka Weinar, “Ukrainian Migration in Poland from the Perspective of Polish Policies and Systems’ Theory”, in Journal of Immigrant & Refugee Studies, Vol. 6, No. 3 (2008), p. 356-365. 28 Dariusz Stola, “Two Kinds of Quasi-Migration in the Middle Zone: Central Europe as a Space for Transit Migration and Mobility for Profit”, in Claire Wallace and Dariusz Stola (eds. ), Patterns of Migration in Central Europe, London and New York, Palgrave, 2001, p. 84-104, http://ssrn.com/abstract=2292616. 29 Krystyna Iglicka, Katarzyna Gmaj and Wojciech Borodzicz-Smoliński, Circular Migration Patterns. Migration between Ukraine and Poland, San Domenico di Fiesole, European University Institute, 2011, http://hdl.handle.net/1814/19720. 30 Marta Kindler, “The relationship to the employer in migrant’s eyes: the domestic work Ukrainian migrant women in Warsaw”, in Cahiers de l’Urmis, No. 12 (June 2009), https://urmis.revues.org/853. 31 Marek Okólski, “Recent Trends in International Migration. Poland 1997”, in CMR Working Papers, No. 19 (October 1998), http://www.migracje.uw.edu.pl/publ/329. 20 Abdelkrim Belguendouz, “Maroc: genre et migrations entre hier et aujourd’hui”, in CARIM Notes d’analyse et de synthèse, No. 2010/67 (2010), http://hdl.handle.net/1814 /15286. 21 Khadija Elmadmad, “Femmes, migrations et droits au Maroc”, in CARIM Notes d’analyse et de synthèse, No. 2011/01 (2011), http://hdl.handle.net/1814/15586. 22 Mohamed Khachani, “Genre et migration au Maroc”, in CARIM Notes d’analyse et de synthèse, No. 2011/12 (2011), http://hdl.handle.net/1814/15616. 23 Chadia Arab, “La migración circular femenina marroquí en Huelva: impacto y cambio”, in OBETS. Revista de ciencias sociales, Vol. 5, No. 2 (2010), p. 165-174, http://hdl.handle.net/10045/16095. 24 Abdelkrim Belguendouz, “Maroc: genre et migrations entre hier et aujourd’hui”, cit. Since the year 200, the pattern of Algerian emigration as a whole has changed.16 Along with the traditional emigration of intellectuals and students, there is now increasing emigration of women: women represent 42 percent of the 4.5 million people who were born in Algeria and are today resident in France. As Figure 4 shows, Algerian women in France outnumber other female presences from the ENP area in the EU, with a sharp increase in numbers from the year 2000. This feminisation of migration in the Algerian context can be explained in the face of the changing configuration of mobility, which is no longer driven by strictly economic reasons but that is also a reflection of the desire to pursue other goals, within a context of social mobility and cultural and economic transnational interconnections. Reasons for migrating may go beyond the simple need for work, but reflect the need to fulfil a variety of projects. Examples include university students who increasingly participate in scientific networks, members of civil society associations taking part into Euro-Mediterranean cooperation, but also women engaged with transnational trade circuits, such as trabendo, popularly called the “biznasiates,” that is the “business women”.17 Hocine Labdelaoui shows how Algerian women in France are increasingly taking on the role of reproducers of the Algerian national community living outside the national territory.18 This is part of a wider political attempt to promote a moral discourse that encourages the incorporation of the diaspora into the homeland and, thus, to increase their investments back home. Migrant women therefore have a pivotal role in the symbolic and physical reproduction of the nation’s identity and collectivity abroad. The reproduction of certain gender ideologies, and the perpetuation of specific gendered roles within the communities abroad, are then also part and parcel of keeping diasporas linked to their communities of origin and explain the contradictory gendered laws enacted by the Algerian government. For example, the government has eased patriarchal control over the migration of women by, for example, making sure that women no longer require the authorisation of their male guardian to leave the country. However, at the same time the Algerian state has kept the clause that fathers, not mothers, have to authorise a child’s passport registration, thus perpetuating the principle that citizenship rights are predominantly male prerogatives and enhancing the cultural construction of women as legal minors. The large number of Algerian women in France also reflects a dynamic and complex situation. On the one hand, it results from the classic pattern of reunification with a spouse who migrated earlier; on the other, this data reflects the increasing erosion of the patriarchal orders that limit women’s ability to exercise their desires and choices. 16 Hocine Labdelaoui, “Genre et migration, en Algérie”, in CARIM Notes d’analyse et de synthèse, No. 2011/12 (2011), http://hdl.handle.net/1814/15597. 17 Ruba Salih, “The Relevance of Gender in/and Migration”, cit. 18 Hocine Labdelaoui, “Genre et migration, en Algérie”, cit. 19 Ali Mebroukine, “Migrations, genre et relations international. Le cas d’Algérie”, in CARIM Notes d’analyse et de synthèse, No. 2011/07 (2011), http://hdl.handle.net/ 1814/15592; Rafik Bouklia-Hassane, “La feminisation de l’immigration d’origine algé- rienne: Un état de lieux”, in CARIM Notes d’analyse et de synthèse, No. 2011/20 (2011), http://hdl.handle.net/1814/15617. Clara Barton (1821-1912) taught school and worked as a clerk in the U.S. Patent Office. With the outbreak of the Civil War in 1861, at the age of 40, Barton embarked on her life's work and vision. During the Civil War she began to assemble and distribute supplies to Union soldiers. Knowing that nurses were urgently needed at the battlefield, she went into the field. At the famous battles of Cedar Mountain, Second Bull Run, Fairfax Court House, Fredricksburg, Antietam, and the Wilderness, she assisted the surgeons in stitching up wounds and in bloody amputations. 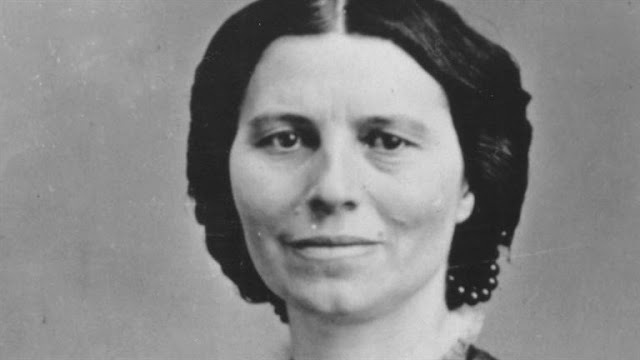 Clara Barton gained national acclaim as “the angel of the battlefield.” After the war she coordinated a national effort to locate soldiers who were missing in action. Also at that time, she was responsible for establishing the first National Cemetery at Arlington, where she personally marked twelve thousand graves. Barton threw herself into relief work in Europe and was impressed with the International Red Cross. Although not permitted to work with the International Red Cross because she was a woman, she volunteered as an independent relief worker in Strasbourg, France, during the Franco-Prussian War (1870-1871). She was restricted to only providing aid to civilians because the German government would not permit her to assist its soldiers. On May 21, 1881, many dignitaries (including Frederick Douglass) joined Barton at her own modest residence in Washington, D.C. to develop the American Association of the Red Cross, which later became the American Red Cross. Created to serve America in peace and in war, during times of disaster and national calamity, Barton’s organization took its service beyond that of the International Red Cross Movement by adding disaster relief to battlefield assistance. She served as the organization’s volunteer president until 1904. Today, the organization’s actions, guided by its dedication to humanity and a desire to promote mutual understanding, friendship,cooperation, and lasting peace amongst all peoples, follow these fundamental principles: humanity, impartiality, neutrality, independence, voluntary service, unity, and universality. Barton also lobbied tirelessly for the United States ratification of the Geneva Convention, also known as the Treaty of Geneva. On March 1, 1882, President Chester A. Arthur signed the treaty. The Senate ratified it on March 16, 1882. The United States was the 32nd nation to sign the document, agreeing to protect the wounded during wartime. 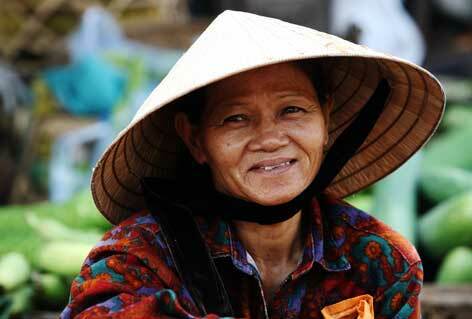 Law on Domestic Violence Prevention and Control of Vietnam. This Law regulates the prevention and control of domestic violence, protecting and assisting the victims of domestic violence; the responsibilities of individuals, families, organizations, institutions in domestic violence prevention and control and dealing with the breach of the Law on Domestic Violence Prevention and Cotrol. Recommendations to the government of the Russian Federation. - To exclude the crimes committed in the family from the category of private prosecution and assigning them to the category of public prosecution. - To set up an effective national mechanism at the Federal level to ensure women’s rights. This mechanism must have power to hand down binding decisions. 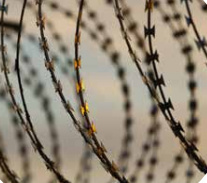 - To introduce in the agencies of the Ministry of the Interior a consolidated system for the collection of statistical data, which would take into account the nature of relationship between the offender and the victim as well as gender breakdown. - To adopt at the Federal level a State Programme on Prevention of Violence against Women. In 2012 the Ministry of Labor and Social development established a working group within the Council on Gender issues for drafting legislation on domestic violence. A representative of a national NGO – the head of the Center ANNA - was asked to chair this working group. The legislation was drafted first by lawyers and representatives of NGOs and then by representatives of the state including the Government Commission on Public Health, the Ministry of Internal Affairs of the Russian Federation, Legislative Committee of the State Parliament (Duma), Labor and Social development and other governmental agencies were cooperating in order to develop a comprehensive law. The draft law was based on best practices that exist in Russia and on the UN model legislation. The hearings on the draft law were conducted with the participation of the Office of the Higher Commissioner on Human Rights, the Public Chamber of the Russian Federation, the Public Chamber of Moscow, the Moscow Duma, and the Presidential Council for Civil Society and Human Rights. The draft law also went through the process of evaluation by each relevant Ministry and was supported with comments by the majority. A significant role in promoting the draft law was played by the Presidential Council for Civil Society and Human Rights that raised the issue of the necessity of adoption of the law on domestic violence in Russia by the President. On the other hand, the NGO community was able to collect over 150,000 signatures requesting the law to be adopted. Work on the draft law that is called “On prevention and response to domestic violence” was a true example of a strong collaboration of NGOs and governmental agencies with the leadership of civil society organizations. In 2012-2015 in Russia 5 non-governmental shelters were opened; most of them are partially funded by local governments. Non-governmental shelters work in Moscow, Nizhniy Novgorod, Pskov, and Vologda. Progressive representatives of Russian Orthodox Church are taking an active stand on the movement against domestic violence and developing an approach aimed at encouraging zero tolerance attitudes toward violence in Cristian families. Every January starting from 2011 the round table discussions on domestic violence with the participation of leading women’s NGOs are conducted within the framework of Christmas Readings. At the round table discussions the leaders of women’s NGOs present the issues of domestic violence and the ways of developing an effective response to cases of violence. The training program on domestic violence for priests was established within the Orthodox Church. They also started cooperation with the leading women’s NGOs in terms of establishing services for women. In March 2015 Center ANNA facilitated opening a shelter by the Novo-Spassky Monastery near Moscow. It can serve as a model for the Orthodox Church in order to be disseminated in the other regions, particularly in the rural areas. Private companies in Russia in cooperation with Center ANNA started to provide support to non-governmental shelters both in kind and financially. The interest of private companies to the issue of domestic violence is a new phenomenon in Russia. It demonstrates the effectiveness of public educational campaigns on violence against women conducted by Center ANNA in cooperation with the entire women’s movement from 1997. New programs aimed at the involvement of men into the movements on combating violence against women are launched in different regions of Russia and contribute to gender equality. One of the best practices is “Papa-groups” that teach men to become fathers and care-givers sharing parental responsibilities with the children’s mothers. This program also includes domestic violence prevention component. Program has been developed by the men’s group in Saint Petersburg in cooperation with Center ANNA.